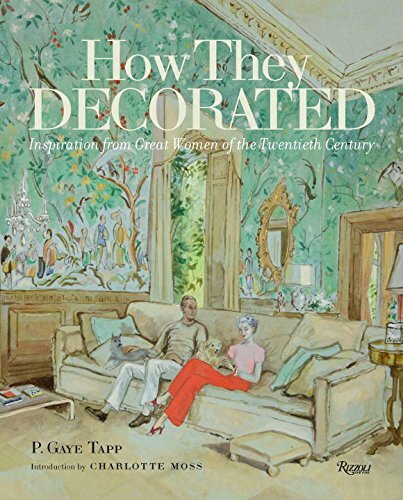 Interior designer Nina Campbell came to my attention in the late 80's when she was tapped to do the interior decoration for the Duke and Duchess of York. She appeared on the cover of House & Garden dressed in red and holding a porcelain apple. She had "arrived" in terms of her introduction to the States. My admiration for the designer began with that cover. Beautiful, British, and ready to swath the royal residence of Sunninghill Park in passementerie. Campell is still attuned to the fine details almost thirty years later. 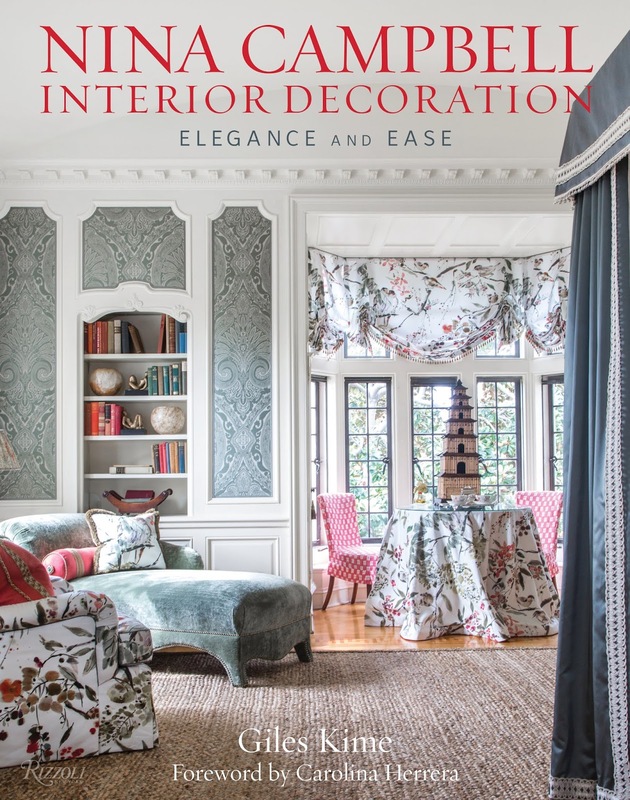 NINA CAMPBELL INTERIOR DECORATION ELEGANCE AND EASE, written by Giles Kime, is a fresh glimpse of her past and present personal residences in London, illustrating the arc of her work —work steeped in tradition, elegance, & ease. 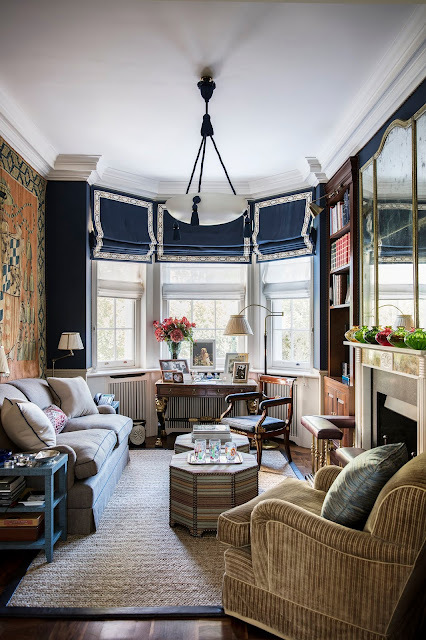 With her love of fabric covered walls, use of passementerie, and her mastery of the ingrained beauty of English decorating, Campbell has opened the doors to her private spaces, revealing interiors that as fresh as ever, and thoroughly English. 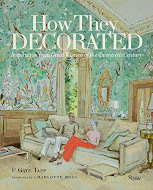 Other interiors from Campell's oeuvre revealed in the book include a hotel in Germany, pieds-à-terre in New York, Rome, & a townhouse in London. This is Campbell at her most eclectic. Two special and different chairs are covered in a Scalamandre silk velvet, and Cole and Son's wallpaper, Gondola, covers the wall. 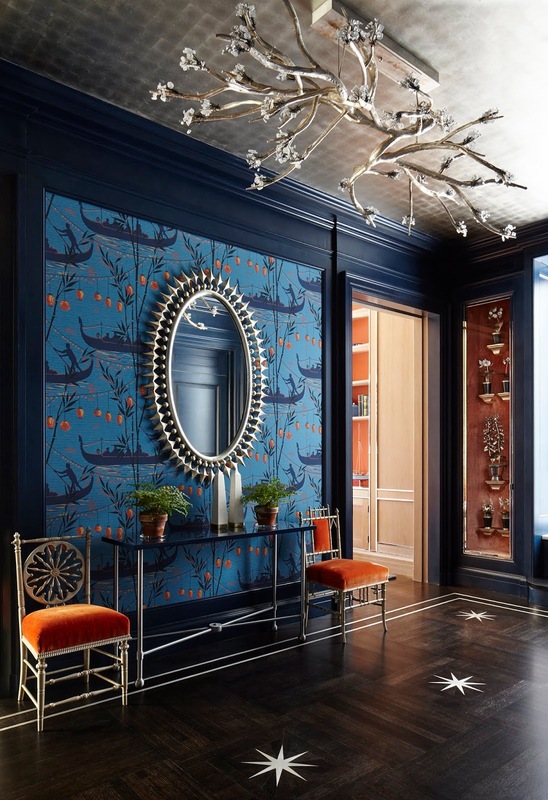 The Foyer is reminiscent of the glamorous rooms of the 1930's—one imagines a bias cut silk charmeuse gown trailing across the ebony floors—glamour a la film star Constance Bennett. Below Campbell's own fabric Cantabria for Osborne and Little covers a sofa tucked neatly into the Study. A graphic Pierre Frey rug adorns the floor. Luxury & comfort (elegance & ease) are essential when Campbell decorates. The smaller space makes possibilities endless rather than limiting. 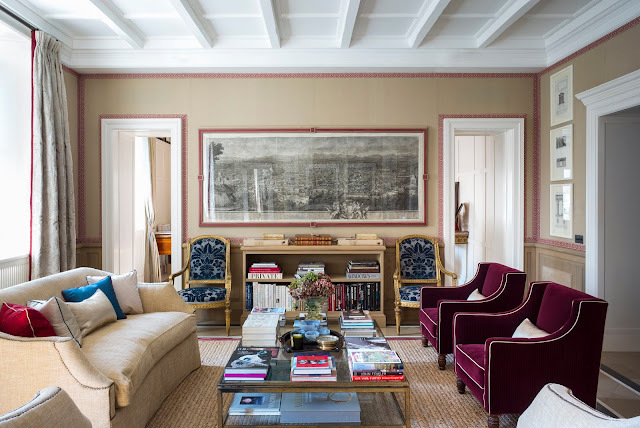 This drawing room in Rome is signature Campbell. The fabric covered walls are intricately detailed with a braid outlining the doors, corners of the room, and windows. An extensive collection of Giovanni Battista Piranesi etchings of Rome and other Italian views highlight the walls of this room and the dining room. The entire apartment is filled with the same elements that Campbell incorporated in the drawing room—sophistocation, Classicism, every i dotted, every t crossed; her instincts always right. Built during the age of William Morris & William De Morgan, Nina Campbell decorated the house by repeating shades of peacock and cobalt throughout. Colors indicative of the era, Campbell uses it subtly—and with abandon. 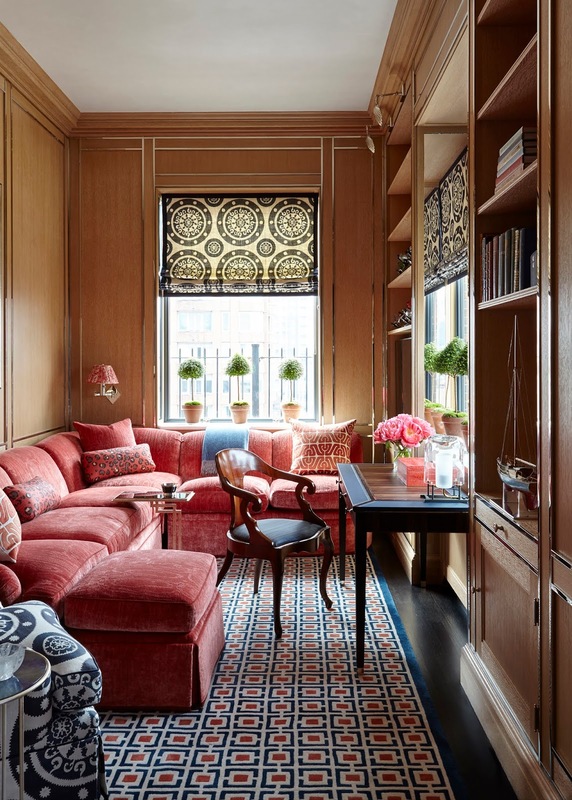 Her knowledge of periods and styles allows her to deftly introduce these details, never using cliched overt references that might dominate rooms that are first and foremost meant to be lived in. In addition, an essay and pictures following the life of Ms. Campell are included in the book. A born Londoner & worldwide traveler, the decorator has never lived anywhere but the Royal Borough of Kensington and Chelsea. Her career began at Colefax and Fowler—where better to be schooled, and later she was sought out to design a collection of papers and textiles for Osborne and Little. 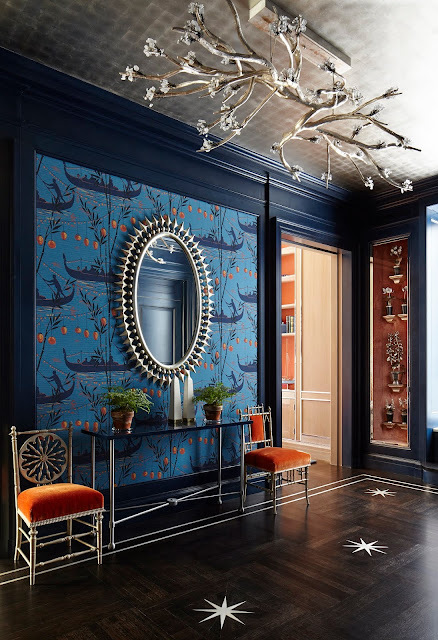 Reinterpreting themes from dated patterns and archives, many of Campbell's fresh wallpapers have adorned the walls of my client's homes over the years. In fact, I recall doing one house strictly in Nina Campbell papers alone—the results amped up the client's traditional furniture & antiques, making a traditional 40's colonial come to life. One could say—filled with elegance & ease.